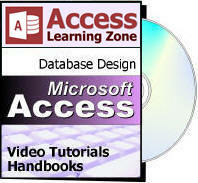 This course is for the novice user who has little or no experience with Microsoft Access. We will begin by learning about databases in general, some important database terminology, the progression from paper filing systems to electronic databases, and the benefits of using a database. Next, you'll learn the importance of planning your database before you build it. 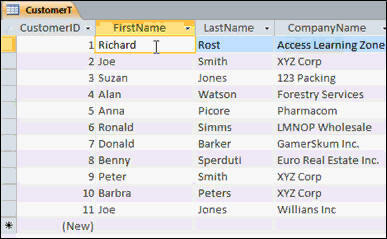 You'll learn how to determine what tables your database will need, and what fields to place in which tables. We'll also discuss laying out your forms to create a "roadmap" for your database. We will then take some time to go over the Access development interface, including the new Ribbon menu, the parts of the screen, the Navigation Pane, and more. We will next learn how to build our first table. We'll construct a table for a fictional company to store all of our customer data. You will learn how to build your table in design view. You'll learn about field names, descriptions, and most of the different data types. You'll learn whether to use text or number fields, depending on the situation. We'll also discuss using AutoNumbers to create unique identifiers (IDs) for all of the records in a table. This is called a Primary Key field, and you'll learn why they're very important. 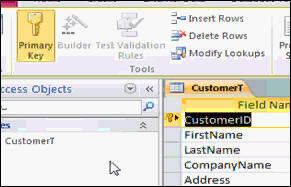 We'll learn how to enter data into our table, edit that data, resize columns, and rearrange fields. You'll learn some rules for storing your data - such as only typing in the digits of a phone number (no dashes or parentheses). 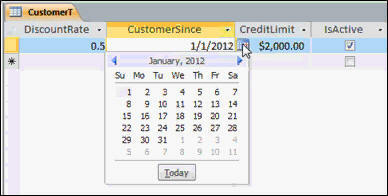 You'll see how to use the Date Picker control to select dates. You'll also see how to use the Zoom window. You will learn why no data is better than bad data. I'll show you how to copy sample records from a page on my web site, and then paste that data directly into your table. You'll see how to delete records, and we'll talk about where the missing AutoNumbers went. You'll learn about the Access Security Warning that you see whenever you download a database from somewhere else. We'll talk about dirty records, saving layout changes, and moving a column in datasheet view. Next we'll learn how to sort and filter our records. You'll see how to perform a single-column sort. You'll learn the difference between text, numeric, and date sorts. You'll remove the sort. Then, we'll see how to filter records. If the boss only wants to see customers from New York, you'll know how to apply that filter to display the correct records. You'll learn how to print a table. Sorting and filtering are OK, but you can't rely on them for daily use. This is where queries are useful. You can design queries to present your data in whatever filtered or sorted manner you want, and then save those queries for later use. 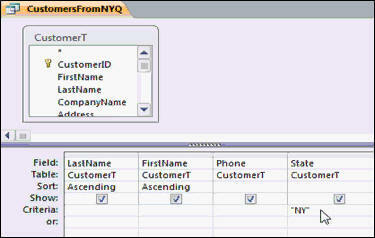 You'll learn how to create a query from scratch using the query designer. You'll see how to add fields to your query, perform a sort, and add criteria to your query. We'll discuss multi-column sorts (left-to-right). You'll learn how to save multiple queries that each perform slightly different functions. 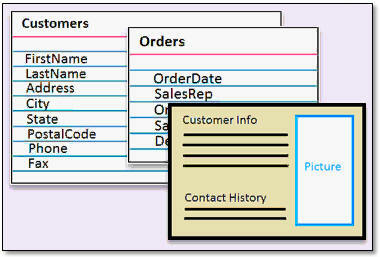 Forms are great for designing a nice, clean user interface for your database. They're especially perfect if other people need to work with your database because you can present to them only the data they need to see - and lock everything else. You will learn how to build forms to show a single record, multiple records (continuous forms), and a split form to show both. You'll learn about labels and text boxes, how to resize them, and how to save your form. We'll discuss editing data in your form, using record selectors to delete records, and how to use navigation buttons to move around. Finally, you'll learn how to construct reports. Reports are good for presenting data to people who aren't using your database - whether its printed, sent via email, or given as a PDF file (all of which we'll talk about in class). You'll learn how to create a simple customer report, how to modify the report title, how to use Print Preview, the Zoom controls, how to change the paper size and margins, and how to switch between layout view and report view. 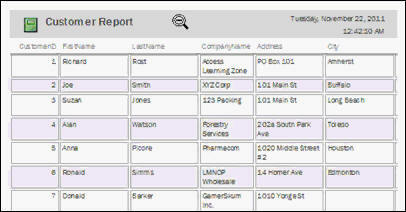 You'll also learn how to use the Report Wizard and create customer mailing labels. Again, this is the perfect class for anyone who is new to Microsoft Access 2013 (or 2010/2007). If you have little or no experience with databases, or you just want to get familiar with how Access 2013 works, this class is for you. You should have some basic knowledge of Windows beforehand, and a little bit of Microsoft Word or Excel helps (so you're familiar with some of the basic, common features), but we'll teach you everything you need to know to use Access to build a simple database. Why use an ID field? Do you have to save records? Can I edit data in a query? 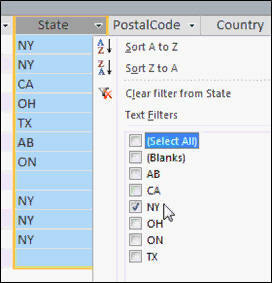 Must I make a query for each state? What is the "*" asterisk for? What are forms good for? 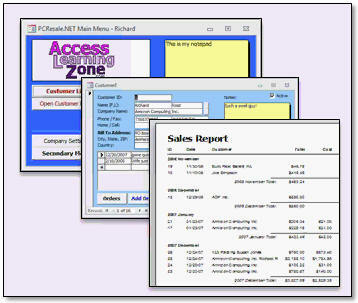 Richard on 8/19/2013: If you are new to Microsoft Access 2013, this video tutorial will teach you all of the basics of how to build a Microsoft Access database. You will learn: - Database Terminology & Benefits - Planning Your Database - The Access Interface & Ribbon - Building a Customer Table - Entering and Editing Data - Sorting & Filtering Records - Constructing Customer Queries - Designing a Customer Form Interface - Developing Reports & Mailing Labels Click here for more information on Access 2013 Beginner Level 1, including a course outline, sample videos, and more. Richard R on 8/19/2013: Because the classes are almost identical, I'm merging the Access 2013 Beginner 1 and Access 2010 Beginner 1 forms. This way all of the people taking the 2013 edition can benefit from the questions and answers asked before. 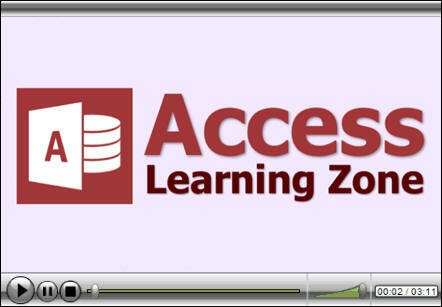 You can find the Access 2010 feed HERE. Myra R Miller on 9/3/2013: I am trying to make a data base for a Key log with a large number of keys. Where as a key is checked out it s taken from the main date base and put in the check out. Thus so I know how many keys are left open. Well, I'm not exactly sure what you mean by "keys" but if you have a list of items and you want to indicate whether or not they're "in use" then just add a yes/no field with a checkbox that you can check ON or OFF based on each item's status. Myra R Miller on 9/4/2013: Thank you so much! sheryl on 1/20/2014: I know basic Access. What tutorial should I purchase to help with VBA in a query?